If I told you that workplace giving is stuck in winter with no spring in sight, would you agree or disagree? Do you sometimes wonder what is going on in our industry? Are we reaching more donors, more volunteers? Is workplace giving dead or alive? Is workplace giving dead or alive? Let’s start our investigation with the obvious … because sometimes we assume the obvious is so obvious that we overlook it. So, where do our workplace givers work and how do they give? Workplace giving occurs in the form of dollars, time, in-kind or some combination of the three. And it occurs at (duh!) places where we work. The point we sometimes overlook, however, is that giving occurs at companies and organizations of all shapes and sizes. Big enterprise companies. Small business. Nonprofit organizations. Hospitals. Colleges and universities. And all levels of government. Total annual giving through the workplace is about $5 billion. But with a private sector workforce in excess of 120 million Americans, plus another 20 million or so working in government, the potential for giving is so much greater. Furthermore, workplace giving was once the domain of enterprise companies, because the economics of raising money from a large group of employees made sense. But technology has changed that. A workplace of any size can AND DOES participate in workplace giving. The most important trend affecting workplace giving over the past 10 or 15 years is how it is practiced. For most enterprise companies, workplace giving has become part of a larger landscape called Corporate Social Responsibility, or CSR. That larger landscape includes programs across many different disciplines and departments within a company. And those programs include employee engagement (hiring, retention, satisfaction), sustainability, ethical behavior, and, of course, workplace giving. Many or most of these programs operate year-round. In other words, workplace giving aka CSR has become more complicated. For mid-sized and small businesses, however, workplace giving is still, well, “workplace giving”. And another point that we sometimes look past: corporate-led programs that help neighbors and communities in need are not going out of style. If anything, they are more important than ever … to the beneficiary, to the donor and to the company sponsor. Don’t believe me? Check out Cone research when you have a chance. So while workplace giving may seem more complicated to some, workplace giving is more important and more ubiquitous than ever! Here is an interesting data point for you. Most of us in the industry have heard of Benevity, Cybergrants and YourCause – leading CSR software companies that focus on the Fortune 500. But do you know which company’s software is used by the most companies in America to run their workplace giving programs? It is StratusLIVE, headquartered in Virginia Beach, VA. Their software is used by more than 1,000 companies and organizations. And among those 1,000+ companies using StratusLIVE software are businesses and organizations of all sizes. So, to sum this up: Where do workers give? Answer: Everywhere. Now let’s look at some of the bad news. Negative headlines, after all, seem to garner more attention in our media-saturated world today. Earlier this year, the Nonprofit Quarterly reported on the “death” of a 38-year old workplace giving campaign, in the state government of Florida. Not good news. While the article did not dig deep into the problems leading up to campaign cancellation, there is no ignoring the fact that the campaign had become a mismanaged dud. Officials concluded that workers had sufficient options elsewhere for personal charitable giving, rendering the campaign unnecessary. Unfortunate. More recently, the NPQ reported on the poor performance of the 2017 Combined Federal Campaign, the largest single workplace campaign in the country. From a peak of $282 million in 2009, with 25% of federal employees participating, the CFC had declined to $160 million in 2016. Then the CFC took it on the chin in 2017, raising $101 million from a meager 4% of the workforce. Ouch. This NPQ Special Report is worth the read, though, as it delves into causes behind the decline while helping the reader to gain a broader understanding of the forces impacting the CFC. Also troubling for the health of workplace giving has been news of fundraising declines and even layoffs at leading local United Way organizations. The United Way of Greater Philadelphia and Southern New Jersey announced layoffs in the midst of this fall’s campaign season. The Greater Twin Cities United Way announced changes in its grantmaking processes due to a 24% fundraising decline over the past three years. United Way of Greater Cincinnati has made headlines this fall for reasons including fundraising declines. In a word, “sobering”. We are seeing workplace giving struggles in the government workforce. And local United Ways face a variety of challenges and market pressures that are negatively impacting fundraising, forcing changes to its business model (more on this below). All that said, however, the bad news may not be “one more canary in the workplace giving coal mine”, to quote one expert in the field. Industries evolve. Customers – especially consumers (donors are consumers, by the way) – demand better services that meet their needs. Perhaps the “sobering” news is more an indicator of an industry in transition, not an industry in decline. No disrespect to United Way, an organization for which I once worked, but United Way no longer represents the state of workplace giving. Nor is the 20 million person government workforce representative of the entire US labor market. The industry has become too large and too complex for any one institution or (large) sector of employees to represent it. As I mentioned earlier, workplace giving is not even “workplace giving” any more. It is often part of a much larger landscape called CSR. And it is important to remember that companies, not-for-profits and organizations of all sizes are practicing workplace giving. So, if workplace giving is alive … (and even well?) … then where is the evidence to be found? I would like to share a series of metrics that demonstrate the health of workplace giving. What are the actual trends? Are people giving more through work? Are they volunteering more time? I would like to … but I can’t … because nobody tracks this data with authority. Twenty-plus years ago, a public charity known as United Way was the 800-pound fundraising gorilla to the market. As a result, we could get our hands on consolidated data and measure trends. Today, the workplace giving and CSR activities expressed as giving campaigns, matching gifts and volunteer time are disaggregated across more than a dozen service vendors and thousands of annual corporate CSR reports. Few share data cooperatively. Industry associations tend to support and track CSR activity among only the largest companies. And most folks like me – trying to aggregate what they can get their hands on – get frustrated. Capital is focused on the market. I wrote about the impact of capital on the market in detail earlier this year, and the point is worth repeating here, in the context of the health of the market. Investors are risking capital to acquire, consolidate and grow CSR software companies. Workplace giving is an important component of these software companies. The measuring of employee engagement and the processing of financial transactions offer opportunities to create better software, impose greater efficiencies, reduce fundraising costs across the industry. And this is good for consumers (donors), charities benefitting from the generosity, and companies sponsoring the programs. But change is hard, especially on older businesses whose business models may become outdated. Which, I think, explains the challenges faced by United Way. United Way and Salesforce are partners. Two big brands collaborating on one big new workplace giving platform, Salesforce Philanthropy Cloud. While the platform name suggests who is captain of this ship, do not underestimate its importance for United Way. The news may not all be positive, as we saw above, but this 100+ year old philanthropy institution is serious about meeting the needs of donors, charities and our communities. Put differently, United Way has not given up on our communities, and we should not give up on United Way. Leading nonprofits are strategically targeting the workplace. Over the past year, we have seen some interesting workplace giving investments undertaken by large nonprofits. For example, St. Jude Children’s Research Hospital has staffed up a department focused on expanding workplace giving relationships with corporate partners. Doctors without Borders has undertaken to study the changing nature of workplace giving via the proliferation of third party software companies that aggregate donors and distribute gifts. The ACLU was recently profiled in the Chronicle of Philanthropy for its success with fundraising drives that target the workplace. CSR and workplace giving software companies are bullish on the market. Almost all workplace giving activity originates via software – desktop software, tablets, mobile apps. Software companies providing this technology are in growth mode. YourCause, for example, reports that 40% of new clients in 2018 are first-time CSR software buyers. Bright Funds is growing. CyberGrants announced a record-breaking GivingTuesday this year. And StratusLIVE has quietly emerged as an industry-leading workplace giving software company with more than 1,000 companies using their platform. It is getting easier and cheaper to process donations. Growth and scale driven by technology improvements should reduce costs in any industry. Workplace giving (and CSR) is no exception. Coupled with the use of Donor Advised Funds, software companies that offer workplace giving solutions have developed efficient conduits to receive, vet, bundle and distribute donations like never before. And the donor data available to charities is more complete than ever. Years ago when I was working at KindMark, we used to challenge ourselves: “If VISA can process a transaction half way around the world over night, distributing payment to a vendor and data to a user account for 3% or less, why can’t we do the same with a gift at KindMark?” We may not have hit a 3%, 24 hour benchmark – yet – but as an industry, we are much closer to such a goal. The Flexible Giving Account. Thanks to the efforts of The Greater Give and philanthropist Dan Rashke, we have the Everyday Philanthropist Act, a bill in Congress that creates a Flexible Giving Account (FGA) for every working American. In full disclosure, CSR Matters has interviewed Mr. Rashke and is an enthusiastic supporter of this effort. While a bill is not law, if (when!) passed, the FGA will created new incentives for employers and employees a like to give more through the workplace. The bill creates a pre-tax account for giving, similar to a 401k, HSA, 529 or other pre-tax benefits account. If you understand how difficult it can be to turn the best good idea into legislation, then appreciate the time, effort and capital being invested to make this structural improvement to the workplace giving industry. Charities and companies alike should get behind this bill. Is Workplace Giving Dead or Alive? You decide! So, what do you think? Dead or alive? 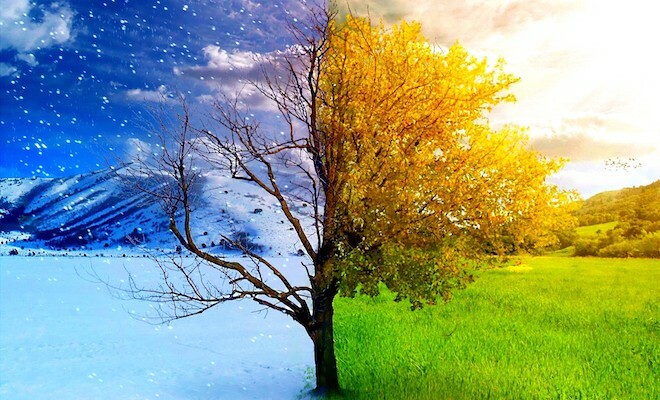 Do you feel stuck in winter, or can you see spring? Workplace giving continues to evolve as a discipline, as an industry. As a percentage of the $410 billion charitable giving market, workplace giving’s $5 billion is only a little more than 1%. But the potential is so much greater. And as I mentioned above, nobody is really tracking and measuring the numbers. Those giving totals are a best guess, an extrapolation of older data, cross-checked against available subsets of giving data. And none of it attempts to understand the quantity or volume of volunteer service hours. That is a shame – this is an important market with tremendous potential. It deserves closer attention and better measurement. Regardless of the current quality of the data, the industry is on the move. Is workplace giving dead or alive? I think you know what I think. Workplace giving (and CSR) seems poised for spring, although the March winds of change can blow with abandon. And while change creates uncertainty, in this industry, change is good. I hope that the examples of positive activity cited above make that point. But are you convinced? If you have an opinion about this topic – Is Workplace Giving Alive or Dead? – give me shout. And as always, if you need help with your workplace giving program, fundraising strategy, or CSR software, we are here to help. A Principal at CSR Matters, Gary has 25+ years of experience working in Corporate Social Responsibility, including nonprofits, software development and the financial services industries. "It's a labor of love. I have a number of professional interests, and they all intersect with CSR." Over the past several years, he has been actively involved in the acquisition, growth and consolidation of a number of companies in the CSR space, including AmeriGives, Good Done Great, WPG Solutions, and Dexterity Ventures, plus donor advised funds DonateWell and Place2Give. Gary's prior experience includes leadership positions with Bank of America, United Way and KindMark. To learn more about the breadth and depth of Gary's operational, financial and executive experience, please visit https://www.linkedin.com/in/gpfcarr/.